This post is a continuation from the one I made earlier regarding how to prepare meeting minutes. It can be found here. Some students of mine are enrolled in a subject named “Multimedia Project”. It is a group project where students setup their own small “company” for two semesters and complete a project for a “real” client. Some have asked for an example of a meeting agenda which should be created before each formal meeting. And pdf document can be found here. As I stated in the meeting minutes post, some organisations will have their own formal templates for how agendas should be written, however smaller companies like multimedia houses generally have more leeway with their design. Spending a few minutes creating an attractive template means a more usable document and one that looks more professional to your client. 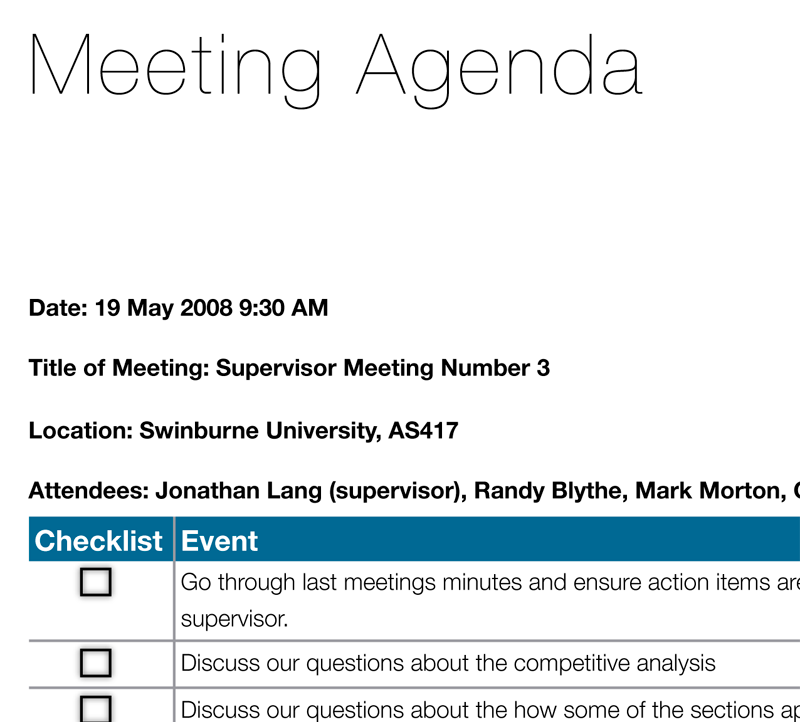 Why is a meeting agenda created? A meeting agenda is written so there is a clear purpose for the meeting, and during the meeting there is a path to follow. It ensures that everyone is on the same page before and during the meeting and that nothing important is missed. It forces people to think about what needs to be discussed before the meeting occurs rather than just “winging it” when they turn up. When should an agenda be created? Agendas should be created before formal meetings. It’s best to start preparing the agenda well in advance, and continue to add to it as the meeting draws near. Starting early ensures you put down all pertinent information. Leaving it until just before the meeting almost guarantees you will forget to discuss something that could be important, or you may get the order in which things should be discussed incorrect. Who should have a copy of the agenda and when should they receive it? As a small business, the agenda will generally be worked on amongst team members. If possible, it is good practise to get a copy to your client or superior prior to the meeting occurring so they are aware of what will be discussed and can plan accordingly. Following this, a list of all the things parties wish to discuss at the meeting should be included. This should generally be done as a list making each agenda item clear and easily marked off as you progress through the meeting. The basic thing to keep in mind is the agenda is a blueprint for the meeting. Failing to create one generally will mean a less productive discussion. Again, an example document can be found by following the link at the top of the page. NextThe jump cut. A video overview. Thank you, I’ve recently been looking for information about this subject for a while and yours is the best I have found out till now. But, what concerning the conclusion? Are you certain about the supply? I have been surfing on-line greater than three hours today, yet I by no means discovered any fascinating article like yours. It is beautiful price sufficient for me. In my opinion, if all site owners and bloggers made excellent content material as you did, the net might be a lot more useful than ever before. “When you are content to be simply yourself and don’t compare or compete, everybody will respect you.” by Lao Tzu. great points altogether, you just received a logo new reader. What could you recommend in regards to your publish that you just made a few days in the past? Any certain? Wow! After all I got a weblog from where I know how tto really get helpful facts concerning my study and knowledge.